Hello beauties, I hope you are all having a great weekend. Before, I wasn't really in to the backpack trend as I don't usual carry a lot of stuff with me, and if I need to take a lot of things about, I'd much prefer a tote. I had seen a few bloggers styling them and I loved how it looked in some photos, I just wasn't sure how I'd pull it off. I recently got a pair of inline skates and have been using them quite a bit. They weren't expensive and are great as a form of sport as well as getting you to places super fast. So because I don't own a backpack/ rucksack, I have one issue when going for a ride: I have nowhere to keep my phone. At the moment I usually take a cross body bag but I can't keep my phone in it as I wouldn't want to crush it if I fall on my bum. So, I've been looking for a cute backpack and found quite a few ranging from €9.20 to €26.40. I found this lovely backpack on the Newlook website. It's a gorgeous summer colour and print which I think will go with anything. This backpack is currently in the sale and costs only €9.20 which is the cheapest I have found. I'm loving the floral print on this backpack. I found it in Bershka and think it would be great for riding inline skates as it seems a lot can fit into it. I think it would look quite nice with my inline skates since they are black and pink. It costs €24.99. I saw this ruckpack and couldn't get over how cute the daisies look. This rucksack is available at LYDC London and costs €26.40. In comparison to the others I found, this one is a bit more pricey but it looks amazing and big enough to fit loads in. The palm tree print is something else I've wanted and this backpack seems to be a great choice as it is colourful and should look great with my usual riding outfits. This backpack is available in the Newlook sale for €12.50. I love macaroons, and I love colours, which is why this rucksack grabbed my attention immediately when I was on the LYDC London website. The macaroons are super cute and the rucksack will look amazing with different outfits. This rucksack is currently on sale for €22.80. As you can see, there are many options and they all look so lovely. Unfortunately, I cannot get them all. I have to get one and would love you help in deciding as I am totally torn. I love backpacks ! 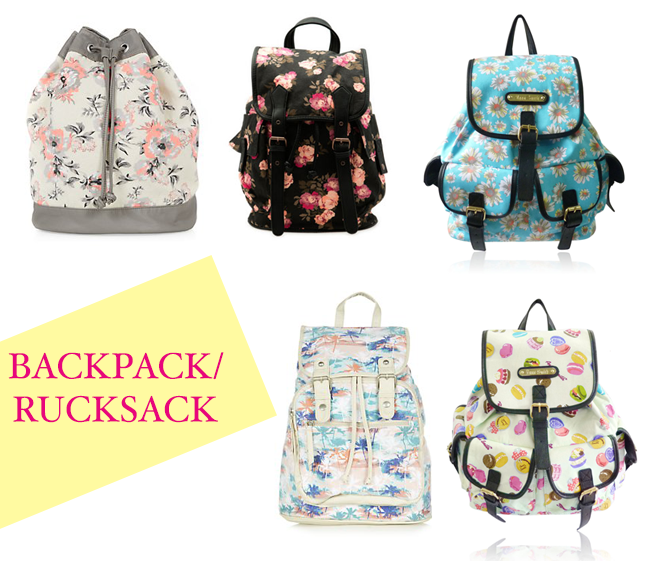 My favorite is White Palm Tree Print Backpack !